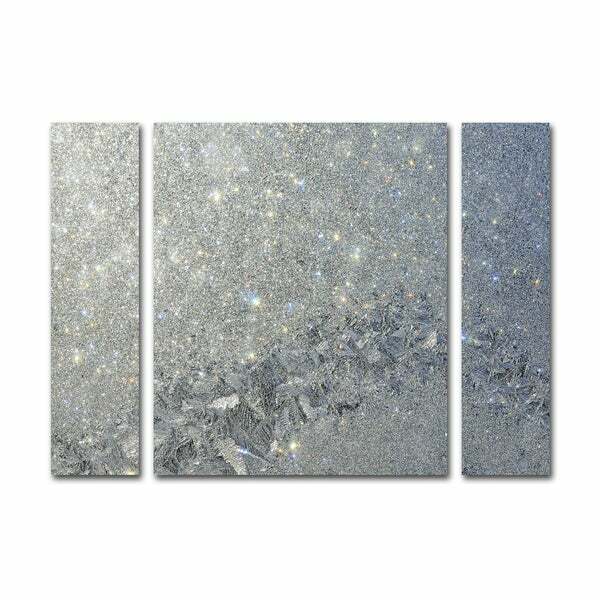 This ready to hang, gallery-wrapped multi panel canvas art set features a close-up view of ice crystals. Kurt Shaffer has been a self-taught photographer since age 13 (1970). He continues to learn the fine art of photography, especially in this fantastic digital age. Though Kurt does not manipulate his fine art photography, digital enhancement is a valuable tool in his business. He states that if he were to change anything in his work it would be to make it look more like it was when he took the original photo. Kurt's love of the earth feeds his photographic creativity and defines it as his truest form of therapy. When photographing people, capturing the nature in his subjects is Kurt's intent and what he strives to do. Overall dimensions: 24 inches x 32 inches. "What is the actual size of the panels?" Panel Dimensions: 6 inches x 24 inches, 20 inches x 24 inches, 6 inches x 24 inches and Overall Dimensions: 24 inches x 32 inches. "Is the picture actually shimmery or is it flat paint?" This item is printed to feature the pattern and color spectrums as shown, but does not contain the actual mirrored shimmer/sparkles.